We know these young men have left their earthly shell. We want to respect and honor these remains, even though we know their souls are with you. They were Tar Heels. We don’t want them lost…. My heart says this is the right thing. These boys have been here 150 years. Their blood is our blood. The only problem with this explanation is that these two men have not been lost. Other than what Scott’s heart told him there doesn’t seem to be any compelling reason to disturb desecrate these graves. There is no indication that the people who disinterred the two bodies have any archaeological training. Joel Holleman wasn’t even a Confederate soldiers. He was a teacher. What I don’t understand is why the SCV didn’t make the effort to improve the existing site. It looks like at least one of the headstones is completely intact. Perhaps the SCV can turn this into a new reality show along the lines of American Diggers. As an archaeologist it saddens me to hear that this took place without specialist direction, the graves clearly contained a lot of information that would have been of great interest to record. On the face of it it seems an odd step to have moved them in the first place, especially if the family had selected that site for them in 1862, although perhaps there were mitigating circumstances. In my experience this type of reburial often tells us far more about the perceptions and beliefs of modern communities than it does about the wishes of the dead, whose thoughts in all but the most exceptional of cases are lost to us. It’s not even clear they had a permit. As far as I can tell the only reason for moving the remains was because someone believed it to be appropriate. Why does the SCV believe they have the right to decide on the final resting place of these two men? Again, one of them wasn’t even a Confederate soldier. No shame. It certainly seems incredible to take such a decision- it is hard to imagine they were buried there side by side if the location did not hold any meaning for their family at the time. It is not for us today to determine that they should be somewhere else, especially if there are no direct threats to their resting place. As you say an improvement of the existing site would have been a far more sensitive approach, and would have allowed the location to retain its historical integrity. I agree. There are certainly situations where I can see it being justified. One of the most powerful stories is the work the Richmond LMA did to bring back Virginians from the Gettysburg battlefield to be reinterred in Hollywood Cemetery. It’s a wonderful place to bring visitors/students to talk about what this meant to the people of Richmond during the postwar period. I’d bet medium-sized money that there were some human remains extant there, that these amateur yahoos overlooked. I’ll bet there wasn’t a screen (apart from the one on somebody’s back porch) within ten miles of that site. I’m appalled at this. I too wonder how someone can just dig up two bodies and rebury them in another place. There should be some kind of procedure for doing this, permits, etc. Is this even legal? Do these dead men have relatives who might object? So many questions, so few answers. And yes Kevin, one of my collateral ancestors was reburied from his grave at Gettysburg to the grave site at Hollywood Cemetery in Richmond. I was proud to be able to contribute to the tombstone, which the US government provided free, and which the cemetery charged a nominal sum for setting in place. They then sent me a picture of it. They simply set the stones in a line atop the common grave. It is a special place of remembrance and reflection. Before we jump to assumptions can we get/ask for a formal explanation? Or is the above from Donald Scott what was given when asked? It is easy to make judgements but I would rather hear it from the horse’s mouth. If you look at the photos attached to the story it is evident that the grave sites were in extremely poor condition. One was intact, but the other was in multiple pieces and both were overgrown with thick brush It would seem then that the purpose of re-interring them at a nearby cemetery is to ensure their graves are not lost to nature, and nothing more. Were you not so eager to jump to conclusions impugning the motives of the persons who relocated them, you might have also noticed that the brother, while not a soldier, was identified as a “Confederate collaborator” in Union records. As to the suggestion that the re-interment was done without a permit or proper archaeological technique, you might do well to follow your own frequent advice to others and abstain from jumping to a conclusion without evidence beyond your own conjecture. Thanks for the speculation. The graves did appear to be in poor condition, but that alone does not constitute a reason to remove human remains and other artifacts. Whether it was done with the landowner’s approval is also of little interest to me. It doesn’t appear that the people who did the digging were properly equipped or trained for this type of work. Perhaps the landowner should have sought out other options. I have o idea what the reference to a “Confederate collaborator” in Union records ought to allow us to conclude. It clearly does not make him a soldier so the placement of him in a grave site with Confederate veterans seems a bit extreme. You should also be aware that there is a long-running thread on a genealogy website about the details of the disinterment. It appears that the current property owner has been thoroughly researching the Holleman brothers for several years now in preparation for their re-interment, and has been in open communication with several of their descendents throughout. Browsing the thread it is also apparent that several of the Holleman family members are supportive of the re-interment, and some planned on attending the funeral service. In short, it appears that you jumped to many hasty and uninformed conclusions that seem to be driven less by the facts of this case than by a whole range of unfounded assumptions you made about the motives of the SCV. I have absolutely no problem with the researching of one’s ancestors. What I do have a problem with is the digging up of graves without a compelling reason. I still do not understand why the grave sites of these two men could not be improved. To top it all off one of the brothers will be buried in a Confederate soldier section of a cemetery even though he was not a soldier. That the SCV offered its blessing and willingness to help should leave folks with questions about their motives. Several Holleman family descendents have also indicated that they support this decision on the thread, are planning to attend the reinterment, and seem to have been in discussions with Hicks about it since at least 2008. If one of my ancestors’ grave was being neglected in a long-forgotten and completely overgrown cemetery, its tombstone vandalized and shattered to pieces, and with encroaching development in the area, I’d welcome an offer to reinter him at a cemetery where his remains would be perpetually cared for. No matter what you think about the SCV, the photos of those graves show them in pretty rough shape and probably under threat of disappearing forever…as others nearby them apparently have according to Hicks. What I don’t understand though is why you have such an obsession with impugning the SCV’s motives without any apparent attempt on your part to research deeper into the real story behind the move. Like I said, I have no problem whatsoever with improving the present site. One of the two is not a Confederate soldier. Forgive me for being cynical but did you consider the possibility that the property owner might have less than altruistic motives for wanted the graves removed. A lot of states have restrictions on the use of land on which known graveyards are located. Bingo. Landowner wants option to develop property, has an impediment. Comes up with win-win solution. This sort of thing happens all the time, almost always with less sensitivity than was displayed here. Credit the landowner for proactively working with the SCV, using them in a way I believe the group is uniquely and ideally suited. Much preferable to dealing with the SCV in reactive mode, which could have easily happened here. We are assuming that the people who collected the remains were qualified to do so. I have my doubts. How do you define “qualified” in this context? 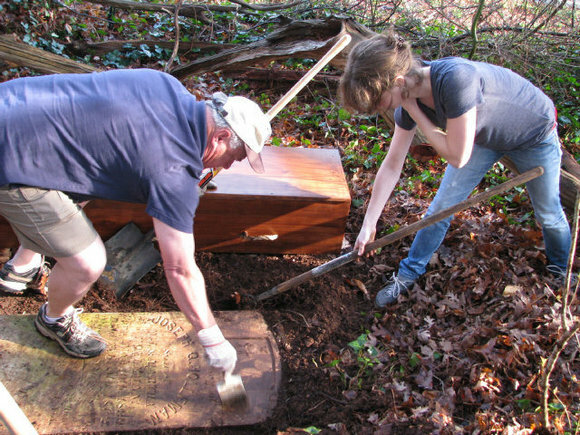 According to North Carolina cemetery law, disinterments and reinterments from abandoned cemeteries don’t require even the involvement of a funeral director (like some states do), much less an archaeologist. What I read in this particular law is that maintaining dignity and respect is the primary goal. I’ve worked with many archaeologists under the auspices of Section 106 of the NHPA, on numerous projects of the kind where their expertise is required by law. While I would not question their qualifications, professionalism varies quite a bit. To historic archaeologists, the artifact assemblage is going to be at least as interesting as the human remains. Opinions might differ on whether that would enhance, or detract from, the primary goal. I see nothing in the news report that suggests the landowner neglected any of his obligations, legal or otherwise. If this was state or federal land, or if federal money is somehow involved in the project — that would be an entirely different case. I am simply asking whether the site was properly handled surveyed and excavated. Here’s the standard: “Due care shall be taken to do said work in a proper and decent manner, and, if necessary, to furnish suitable coffins or boxes for reinterring such remains. Due care shall also be taken to remove, protect, and replace all tombstones or other markers, so as to leave such tombstones or other markers in as good condition as that prior to disinterment.” Sec. 65-106(4)(g). It’s a pretty low bar, for sure. No professional qualifications required. According to the law, anyone with a shovel is qualified to do the job. As to your question, I doubt any member of the Society for Historical Archaeology, and/or the American Cultural Resources Association, would consider the work properly done unless it was done by a fellow member. But who’s going to pay for that? I’ve submitted the invoices for that kind of work. Suffice it to say that if arch work is not required by law, if it’s going to happen, it will have to be done pro bono. And that will tick off still other archaeologists, especially the ACRA guys. Interesting Phil, thanks for all the explanation and background information – that does help in understanding this situation. So in order to “honor” these soldiers, they stand on the marker, and move the bodies? If they needed to be moved, the least that could have been done is rebury them ceremonials andwith military honors, not as a saturday afternoon chore? Not knowing the whole story it’s hard to say for sure, but it seems a little odd….. It is my understanding that they will be re-buried with other Confederate soldier, even though one of the brothers was not a soldier. That said, I still don’t know why they were disinterred to begin with. The only person that can answer that question is the landowner himself. You are absolutely right. As I stated in an earlier comment, I am not necessarily averse to the transfer of remains under certain circumstances. Yesterday, the 2 Holleman brothers were laid to rest side by side as they were 150 years ago in the Confederate Section of Oakwood cemetary w/military and Masonic honors and dignity. Thank you to the Cary Masons Lodge #198, 6 & 26th NC Troops reactivated, LL Polk & Bennit Duke SCV camp, the Holleman family and land owner Ken Hicks for for bringing this to fruition. Joel Holleman, 28, was the oldest of 3 brothers & 4 sisters, a Scribe at the Masonic Lodge in Cary where his father presided as Master, a teacher, a sunday school teacher and a medical assistant at the Fairgrounds Hospital during the American Civil War. He served the community in many ways. The last service at the CS Hospital is what branded him as a CS “collaborator” by the US Gov’t. He died of unknown causes on 1 Jan, 1862. Joseph Holleman, 22, was a CS soldier who enlisted in the 26th NC Troops at Camp Crabtree, Sept. 10, 1861 then his older brother Hiram the next day. The 26th trained at Camp Crabtree until they were sent to Bogue Island in the Outer Banks near Morehead City and Ft Macon. Joseph contracted pneumonia and died in a Morehead City Hospital on Feb 9, 1862, and was buried in his uniform. The Holleman Brothers graves were located off Trinity Road, close enough to the interstate that interstate traffic was easily heard and developement is near by. Land owner Ken Hicks fearing the graves may be lost in the future and forgotten, approached Don Scott about some abandon grave sites on his property. Mr Hicks stipulated that the brothers had to remain next to each other as they had been for the last 150 years. Joel’s tombstone was in poor condition, broken and in several pieces. Joseph’s was broken and laying on the ground. The only identifiable remains left after 150 years were a couple teeth. The rest was unidentifiable as human, just discolored soil. Some of the artifacts that were recovered included coffin nails, bits of wood, bits of cloth & buttons (Joseph’s eight 7 point NC starburst military uniform buttons, and shirt & drawers of both), gold cuff-links and a small broken bottle in each grave. All artifacts were buried with their respective former owners. Mr Scott oversaw the entire project from planning to yesterdays ceramony. Tombstones were repaired by local monument company. New coffins were made by a volunteers. Only period methods & materials were used in the consctruction of the coffins. The remains were stored in a local funeral home. Yesterday morning the brothers layed in state at the NC Museum of History w/honor guards provided by the 6th & 26th NC Troops reactivated. The horse pulled artillery caisson used was from the Reilly’s Battery another reenacting group. 3 volley’s were fired in honor by the Honor Guard during grave side ceramony. The 2 NC flags that were draped over the coffins were presented to the Holleman family present at the ceramony. All of this at no cost to the taxpayers. see the news article below for some pics of the ceramony. Thank you for letting us know the end of the story, and an apology for jumping to an opinion, al be it understandable with the the information provided in the original article. I’m glad I was wrong, and that proper honor was given to these 2 men. And the SCV went ahead and buried an individual in the Confederate section of a cemetery who was not a soldier. Kevin, and the problem is???????? Jefferson Davis was not a soldier, but I believe he could have been buried there if his family had desired it. I believe being branded as a “Collaborator” by the Federal Gov’t is more than enough to deserve being buried in a CS Cemetary. By this status alone, after the war a special pardon was required to recieve your rights as a US citizen. If he didn’t earn the right by caring for sick and wounded CS soldiers, isn’t a family member allowed to be buried at a National Cemetary presently? I can tell you that it is fitting and proper that they are. If you don’t believe me call the Veterans Administration and ask them! I don’t see any difference here! Besides, there isn’t a long, or for that matter short list of people waiting to be interred there. I believe the SCV is more than qualified to decide who may be allowed to be buried there. Isn’t a family member allowed to be buried at a National Cemetary [sic.] presently. . . ? If you don’t believe me call the Veterans Administration and ask them! Not brothers, no. Spouses, minor children and (in certain circumstnaces) dependent adult children, only. And of course Jefferson Davis had an explicitly military role as “Commander-in-Chief of the Army and Navy of the Confederate States,” as outlined in the C.S. Constitution (Art. II, Sect. 2, Paragraph 1). I understand the points you’re trying to make, Mike, but before you go spouting off examples, do try to make sure they’re actually, you know, valid. Otherwise you’re undermining your own argument. Erica, no problem, I fault the media for not telling the whole story! The burial site on the property was most definitely in the way of west Raleigh development trends. There was a forensic anthropologist on site for the dig. Apparently (I wasn’t there, but family members were), the type of clay these two were buried in was pretty devastating to the remains. There were buttons, bones, and very little else. One of the brothers was indeed a Confederate soldier. The other had been listed in national documents as a Confederate collaborater. Your post did indeed jump to assumptions. The site is not far from the PNC Arena off the highway there, and it is an area slated for development. The current property owners’ acted mercifully, respectfully and kindly about the whole situation. They chose not to desecrate and disrespect people they didn’t know. I am pleased to hear it. Thanks for the comment. This really upsets me…..grave robbers!!! Hallowed Ground destroyed! Why did they feel they need to be dug up and removed? I mean, weren’t they breaking the law by digging them up? Seems like it should be done by competent personel, with legal license, etc, etc. I don’t know who may see this at this late date but… The info failure was by the writer above for not doing and reporting proper research. It took 3 years to get all the proper permitting from the state and county and all was done according to law. There was indeed an experienced scientist ‘in charge’ as the State of North Carolina requires this and I believe he was an official of the North Carolina History Museum. Where the remains lay until the reburial. The ceremony was very moving and with all respect due to my Great-Grandfather’s cousins. There was a Masonic rite for Joel and the SCV gave Joseph full military honors and the chaplain of the 26th NC Regiment led a Christian service. I know the property owner well. His motivation was that West Raleigh (indeed ALL of Raleigh) is growing and areas that used to be rural are now under so much pressure from development. He, like me , is getting up there in age and he feared what might happen after he is gone. He chose to do something, not to let history and cherished remains be subject to future development. It took 3 years to accomplish! The site was the farm of their father, Wyatt, who eventually lost the property to a foreclosure. ALAS! Joseph, 21, enlisted in the Confederate Army and Joel went to enroll the next day. When they realized he was an educated teacher and Secretary of the Cary Masonic Lodge, they asked him to instead be administrator of a military hospital being established, which he accepted. He died in Jan. 1862 of a illness contracted there. As he was officially listed as a collaborator, his remains were accepted into the Confederate section of Historic Oakwood Cemetery. The third brother, Silas (not Hiram) was captured and spent months in a Union prison. Joseph died a month later of pneumonia in Feb. 1862. NC 26th was garrisoned at Camp Glenn at Carolina City (now Morehead City) in defense of Fort Macon and Joseph’s Lt. in Co. D was my GGF, J. T. Adams, wounded at Malvern Hill and Gettysburg, who rose to command the 26th and was with Lee at Appomattox. Thank you for providing additional information on this story. Being an amateur civil war historian and a “relic hunter” for about 50 years now, I have watched “progress” in the Atlanta area, destroy our civil war history. I’ll never forget back in the late 60s while hunting in the woods off of Cascade Road in southwest Atlanta, running across a small unmarked cemetery. The graves were only identifiable from the depressions in the ground and the field stones…….some orderly and some not. When I returned home, I checked my topography maps and found no indication of a cemetery being in the location. Searching civil war era maps also provided no clues. I wrote a letter to my city councilman and I of course never heard anything from that. Over the years, I simply forgot about the small cemetery that I had found. Several years later, while passing through the neighborhood, I saw where the area was built over with new houses. Oh well…….you can’t stop progress! It was only a few graves and I am sure the people buried there were of no importance! I applaud any and all efforts to preserve the graves of our ancestors. If we wait for “the Government” or “the professionals” to do it, it will never happen. In the end the SCV did not just willy nilly dig up graves for no reason.